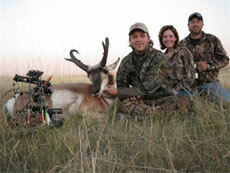 Archery antelope hunts are one of the best ways to harvest a trophy antelope. Hunt over waterholes for the best success at harvesting your trophy. This hunt is available as either a town, bunkhouse or camp hunt. Hunt dates start mid-August. Licenses are available on most hunts. 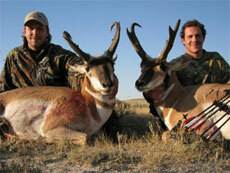 Success has remained high on all the archery antelope hunts, traditionally running over 90% with 100% opportunity. Hunt the rolling grasslands on these spot and stalk Wyoming hunts. These hunts remain the best first-time western adventure. With high success and a lot of animals to choose from. Again no need to worry about drawings as licenses are available on most hunts.